I am a bit late with this report but I am back reporting Go Daddy auction results. It was really funny how I found how to do it. But I am not telling… lol @ Go Daddy. Watch out for a New Spam/Scam Using Escrow.com To Get Your Attention. Here are my 13 ways to make Go Daddy auctions better. A Go Daddy rep replied and gave a solution to 1 of the problems: email support. The other 12 problems (plus the ones written in the comments) remain. Here is a poll with over 440 votes so far: “Are You Renewing Your New gTLD Domains?“. 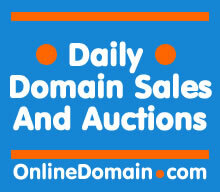 Click here to see domain sale reports from the past week. .World is releasing soon. Will you be ordering any .World gTLDs? I might get a couple. I have pre-ordered one so far.